Occupational Therapy for children and young people living in the South East of England. Our dedicated assessment and sensory integration therapy centre is the first and only one of it's kind in Sussex. 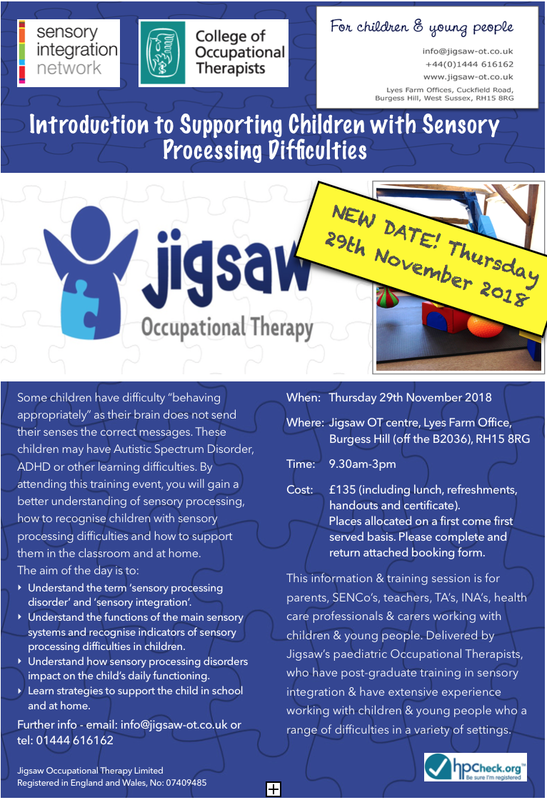 Jigsaw Occupational Therapy would like to extend to you a special invitation to a training day at our sensory integration therapy centre! We are a specialist provider for children and young people living in the South East of England. We founded and manage a dedicated assessment and sensory integration therapy centre, the first and only one of it’s kind in Sussex. We work with children and young people experiencing a wide array of profound and multiple disabilities. Some of these conditions include; cerebral palsy, autism and Aspergers syndrome, sensory processing disorders, acquired brain injures, motor co-ordination difficulties and learning disabilities. As well as providing assessments and therapy sessions we also work closely with Local Education Authorities and schools providing assistance in maintaining a child or young person’s special educational provision as specified in a child’s statement of Special Educational Needs. Furthermore, we offer assistance and training to parents, teachers and professionals to help develop practical approaches and find solutions to help children and young people get the most from life. All of our Occupational Therapists are trained sensory integration practitioners and have a wealth of experience working together with schools for children and young people. We are conducting a training day at our therapy centre on the Thursday 29th November from 9.30am-3pm, on supporting children with Sensory Processing Difficulties. The training session is for parents, SENCo’s, teachers, TA’s, INA’s, health care professionals and carers working with children and young people. For more information please see our attached flyer, or contact us on 01444 616162.